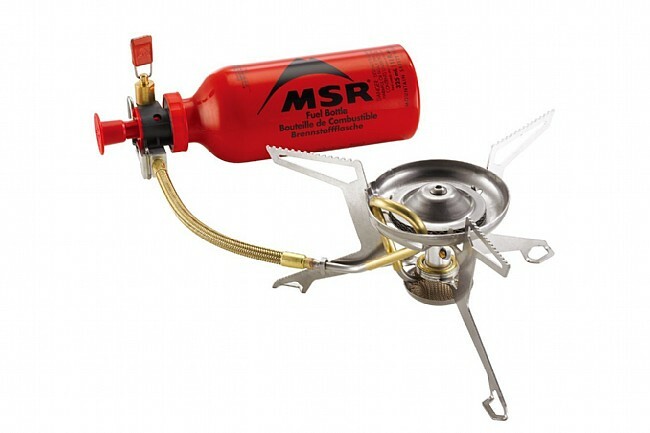 The Whisperlite International Stove from MSR is easy to pack, use, clean, and repeat. Compatible with multiple types of fuel, this stove’s versatility is a major asset for backpackers and campers alike. Made of sturdy yet lightweight stainless steel and aluminum, this stove reduces trail weight and will effortlessly endure years of regular use. For easy cleaning, the Whisperlite International Stove features self-cleaning Shaker Jet™ technology. Includes: Fuel pump, windscreen, heat reflector, small-parts kit, instructions, and stuff sack. Fuel bottle not included. Minimum Weight: 11.2 oz (0.32 kg). Packed Weight:14.9 oz (0.42 kg). Fuel Types: white gas, kerosene, unleaded gasoline. Burn time (white gas): per 600ml (20 oz) of fuel, ~110 min. Burn time (kerosene): per 600ml (20 oz) of fuel, ~155 min. Boil time (white gas): 1 liter (33.81 oz), 3.5 min. Boil time (kerosene): 1 liter (33.81 oz), 4.4 min.